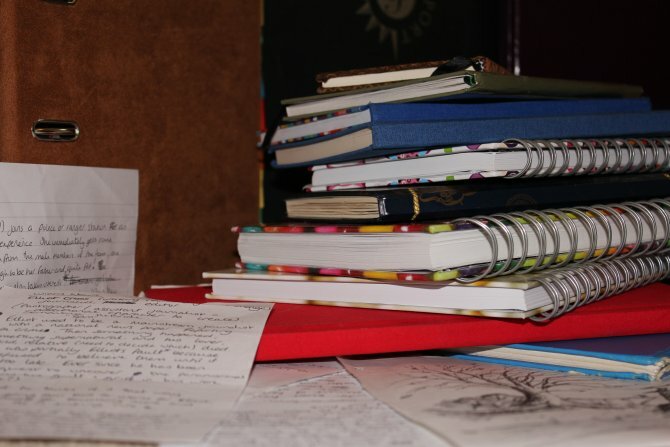 All of the bloggers taking part in this blog hop event will be posting pictures of their journals, and talking a little about how journals, and paper in general, play a role in their writing practice. NOTE – click on any of the images to read more. As soon as I got a computer of my own as teenager, I started using that to write my prose. Writing my drafts on paper seemed like adding an unnecessary step; it would have to make it into the computer eventually. Given that I couldn’t type without looking at the keyboard, copy typing from a hand written manuscript would have taken many long, boring hours… per page! Now I can type while looking at the screen and my typing speed is not much slower than the speed I can write by hand. It’s certainly fast enough to keep up with my brain. For me, paper is a planning tool, a tool for exploring ideas. I like to take advantage of the fact I can write and draw on it in any way I like. Notebooks are a great way of making sure all your notes stay together but I used a lot of loose paper sheets for jotting down ideas. I do most of my actual writing on my laptop, but paper often comes back into the mix during the rewite and editing phase. Post-it notes are a great invention. When I was struggling to work out a plot hole and pacing issue in my draft novel, Hidden Talent, I wrote each scene down on a post-it note and tried them in different orders stuck to my coffee table. It also turned out to be a great way to explain my dilema to my partner so I could bounce ideas off him and talk it through. I can’t imagine being able to work completely without paper. Even with programs like Scrivener and Photoshop to expand the functionality of my computer beyond simple word processing, there is something uncomplicated about paper, a freedom of expression. I turn to paper when I am out of my comfort zone, when I need to seriously wrestle with a problem. Somehow the act of drawing the pen across the page adds gravity and momentum to my thoughts. It is as though words written on paper have more weight than strings of characters on a hard drive. After all, as writers, we all want the ultimate destination of our words to be the paper of printed book. What is your relationship with paper like? Do you find you use paper for certain parts of the writing process more than others? Has anyone found they have been able to move completely away from the pen? I hope you’ll share your views in a comment. Hi, my name is Chrissey and I have a stationery addiction. Some girls like buying shoes, I like buying pens, folders, notebooks, stickers and all things stationery. In celebration of my first blog hop, I’m going to do a little stationery give away comprising a funky cheese puff notebook and a pencil. Leave a comment and follow me, either here or on twitter @arcadestarlet and I’ll draw a winner next Friday. Remember, if you win the give away, you must be willing and able to provide a suitable postal address. If you wish to opt out while still posting a comment, please include “not entering” in your comment. I might not have a fetish for them but that one just grabbed me. Usually I’ll cover my plain notebooks in stickers from Metal mags I buy for myself and my eldest son. There’s been some bloomin’ gorgeous Iron Maiden ones doing the freebie rounds, so I have some *very* Eddie-tastic notebooks. Have to say, your notes look VERY organised. Friends give me note books and journals. Some look too good to use. I like the flat black notebooks that fit in my purse and have secure pages. I wish I could remember who makes them. MY handwriting has not improved over the years and I use the computer more often than the pen. But, if I have a poem in mind, I always write it by hand. When tech. is as easy to use as paper I don’t think I’ll look back… until then it still does things all my electronics cannot. Oh yes, Chrissey: post-its! Such a great invention to keep our bubbling minds organised. Have you ever tried those big index cards ones? They’re perfect to fit in new scenes. Loved your drawing, an artist! 🙂 It’s a funny thing, the older I get the more I appreciate paper and ink. Like an old friend when you go back through journals. Computers just don’t ‘show’ us the stuff on the inside of people quiet as well. You’re so right – it IS a relationship with stationary. And that is no doodle, my friend. You have many talents, I see. Happy Scribbles Hop! I type faster than I write, so for me writing by hand is a chance to slow down and focus on a small problem at a time, or to jot notes while I’m AFK. And sometimes it’s just plain fun to write by hand. I love seeing my thoughts on actual paper… even if my handwriting is pretty bad. I love browsing the stationary & notebook section at B & N or Staples. When in Chicago once, I went to the Crane store downtown – a writer’s heaven! Beautiful paper, notebooks, pens… amazing. Great post! (not entering) I’m happy with my Moleskine! Gawd, that’s a beautiful doodle. All my life, I’ve wished i could draw like that. My dad & my brother have it, so does my son, but me? Meh. I can type a lot faster than I write, but sometimes even that’s not fast enough. For me, paper means portability. Oh, have you seen those 4×6 ruled Post-It notes? Freekin’ awesome, especially when you need to do something more than flagging a typo or fixing a phrase. Wow, a lot of detail and nice to see that you’ve doodled some of your sequences to help keep it easy to follow. Great idea. I do like the idea of using post it notes, thanks for the suggestion. I like your art work, can’t call it a doodle. You are a lady of many talents. I always enjoy your blog posts and look forward to the next one, every Friday. I completely agree – paper always seems so much more practicable when trying to work out a problem, or to play around with the order of things. I’m loving Scrivener and it’s corkboard but it still looses something in the translation, something that I don’t think technology will ever be able to replicate. Whenever I come to edit something, I’ll always print it out then get a pencil and start editing. It just isn’t the same on screen, or at least my brain doesn’t seem to work in the same way if I try to do it all digitally. Thanks for all the great comments guys. I’m away for the weekend and will be hopping around the rest of the blog hop on Monday. In the mean time, a reminder that if you want to join in the giveaway you have to either follow me on WordPress or Twitter as well as posting a comment. Otherwise I may not be able to contact you. “Somehow the act of drawing the pen across the page adds gravity and momentum to my thoughts. It is as though words written on paper have more weight than strings of characters on a hard drive. ” <— This sums up exactly how I feel about writing longhand. For novels I use it only for planning or trouble scenes, but it's my favorite way to write.